Suicide remains a deeply strange phenomenon. Its disturbing nature is likely bolstered by what we perceive to be a grotesque violation of our basic biological strive for survival. Though biomedical science has exterminated many of the ailments which cut human life short in previous generations, it has yet to conquer the demons that haunt our minds. Suicide is a problem in rich and poor countries alike, and perhaps the most paradoxical study of the subject found that suicide rates tend to be highest in places with the highest levels of happiness. There are two trends that stick out: (1) While suicide rates are up everywhere, small cities, towns and rural areas showed the largest increase. In those places, suicide rates increased by about 20%, while they only increased by about 7% in large cities. (Note: “Large fringe” refers to suburban counties.) (2) Suicide rates are lowest in cities and gradually worsen as the counties become more rural. In 2013, the suicide rate was 17.6 per 100,000 people in rural areas, but only 10.3 per 100,000 in large cities. Another study released in March corroborate these results: Young people aged 10-24 living in rural areas are about twice as likely to commit suicide as those living in cities. Again, over time, the rural suicide rate increased at a greater pace. What is driving this trend? That is hard to say. An analysis in The Atlantic suggests that greater access to guns, feelings of social isolation, fewer doctors, and stigmatization of mental illness all possibly contribute to the higher suicide rate in rural America. Whatever the cause, America’s suicide epidemic is getting worse. Source: Centers for Disease Control and Prevention. 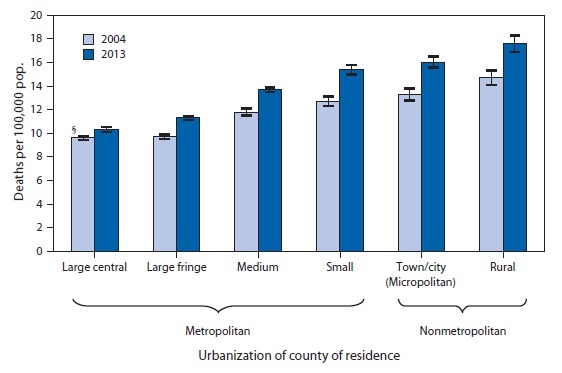 “QuickStats: Age-Adjusted Rates for Suicide, by Urbanization of County of Residence — United States, 2004 and 2013.” MMWR 64 (14): 401. April 17, 2015.